What is better than creating a wishlist for everything you can't buy straight away? SOB! Online is such a magical place where you can browse and add things to your cart but not pay for them . These are the items I have been eyeing up recently and here's why. I am a palette hoarder and I just find palettes are more convenient to store and give you a lot of options when it comes to makeup. I have seen Laura (from Laura Hadley) recently picking up the Tarte Amazonian Clay Blush Palette and it has made me want it even more. I have never tried Tarte before since it's a difficult brand to get a hold of in the UK but I have heard amazing things about Tarte especially their Amazonian Clay collection. Another Tarte product is the Shape Tape Concealer, I am very much YouTube-influenced and there has been so much hype about shape tape concealer it is creamy and full coverage which is what I look for in a concealer but it is definitely pricey even though it comes with a blending sponge. I have problem undereye area and am always looking for products that can help with fine lines since it is such a delicate area and it will only get worse with age. I've read from Andrew (from Beauty and the Boy) that the Hylamide SubQ Eyes Advanced Serum works wonders and I always mean to pick it up in stores. Would this be a wishlist without another eyeshadow palette? 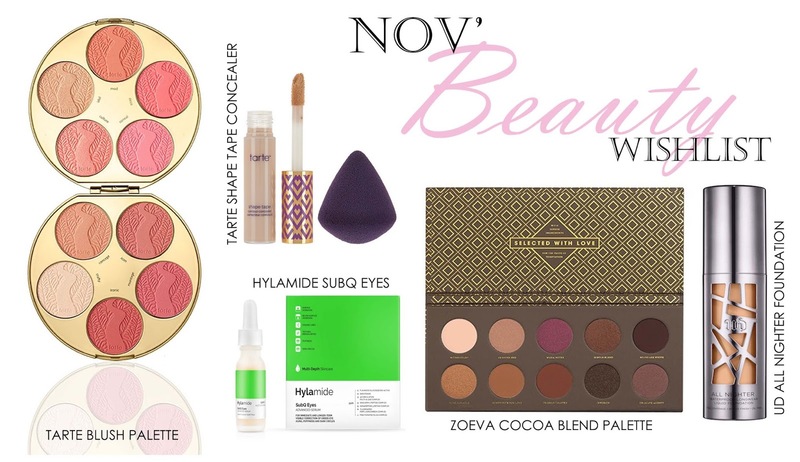 I have heard amazing things about the Zoeva Cocoa Blend Palette which has beautiful warm shades and a mix of different finishes. Everyone in the beauty community raves how pigmented and creamy this palette is and I really want to try out their products. Lastly a foundation option, there are soo many foundations I want to try out but most recently I have been looking at the Urban Decay All Nighter Foundation the most. It is full coverage, oil free and has a matte finish. It ticks all the right boxes, I just need to haul myself to a UD counter for a shade match. That is all for this post, I've made a HUGE Colourpop order and purchased the Kathleen Lights X Morphe Palette which I am waiting to arrive so I am on a spending ban at the start of the month (emoji face) so be prepared for that. I hope you've enjoyed my little wishlist. I've heard tons of bloggers raving about that concealer recently, definitely need to give it a try!